Modiphius Entertainment has released a free player guides which lets players play as Tribbles (as an April’s Fools joke of course) in Star Trek Adventures which you can download here. On April 5th in celebration of Star Trek First Contact day, Modiphius is offering a 50% discount on all our Star Trek core book PDF’s. Finally, they’re releasing the Star Trek Landing Party miniature box set and the Star Trek Iconic villains box set for July 2019. 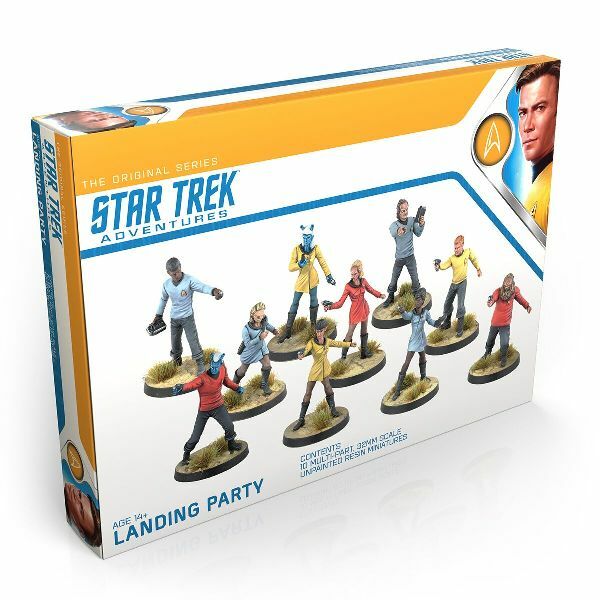 Star Trek Adventures Landing Party contains ten highly detailed, 32 mm scale, unpainted resin miniatures of a Starfleet away team for use with Star Trek Adventures the tabletop roleplaying game. This set contains one male officer and one female officer of the Andorian, Denobulan, Tellarite and Vulcan species, as well as two male humanoid miniatures. Star Trek Adventures Iconic Villains contains 8 highly detailed, 32mm scale, unpainted resin miniatures of iconic Star Trek Iconic Villains for use with Star Trek Adventures the tabletop roleplaying game. This set contains Khan, The Borg Queen, Q, Locutus of Borg, Gul Dukat, Lore, General Chang, and the Gorn Captain.